My mother was always a fabulous cook, and every night we sat down to a meal fit for a king. Our dinners were absolutely fabulous and gave us little reason to eat out. 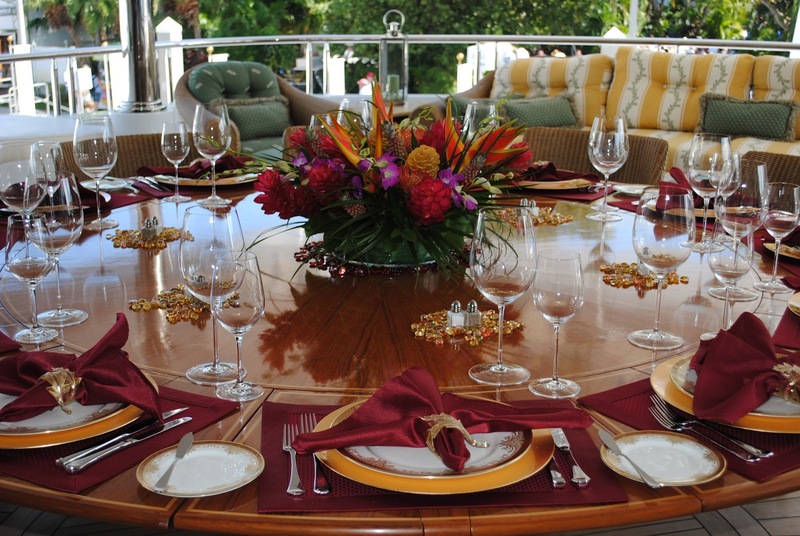 My mother also loved to set a beautiful table with her collection of beautiful dishes, table cloths and accenting cloth napkins. 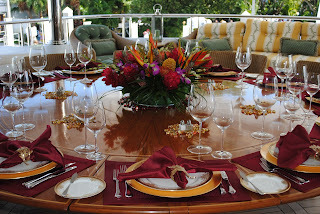 In addition, she always put together a beautiful floral arrangement and sometimes added candles! When my friends came for dinner, they always thought that Mom had done it all just for them and I could never bring myself to tell them we ate that way every night. Sadly, I didn't inherit that gene. I cook fairly simple meals, use placemats, and paper napkins and although we do have people over for dinner occasionally, feeding company is very stressful to me. Knowing that John and Olivia frequently fed the LDS missionaries in their area, I was tickled to learn about a few of the meals they fed the missionaries and I have to admit, I've never even considered serving my guests either squirrel or possum! In the John J. Pledger Murphy journal, I found the following entry for Saturday, October 23, 1886. "John Ganus and I go a squirrel hunting we kill one squirrel after two hours hunt. Returned to Johny and have squirrell long leg colards and swete potatoes for dinner. Nute and Boby Ganus and John Bailey goes to town withe cow and calf. They return and John Ganus goe withe them to Baileys a possum hunting. Catch one fine fat possum. Frank and Rod Ganus came home." "At 9 A.M. Johney and the boys come with the old big fat possom. we scald him and scrape him and sister Ganus cooked it for diner. I et one hind leg and soem cabage at 1/2 past 2 oclock." I guess I really had no idea what was involved in hunting possum until I ran across the following article in a newspaper describing the process. 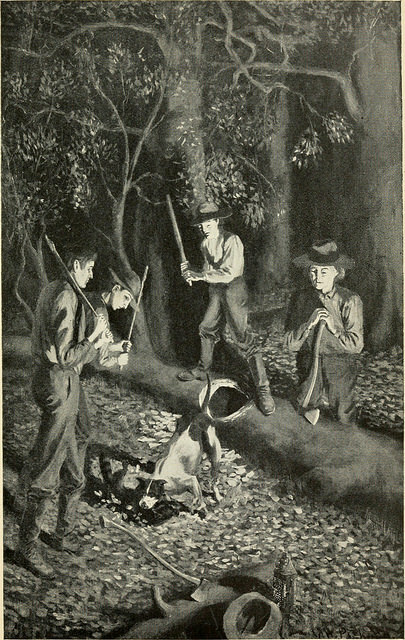 "The Opossum--The hunting of the Opossum is a favorite sport with the country people, who frequently go out with their dogs at night, after the autumnal frosts have begun and persimmon fruit is in its most delicious state. The Opossum, as soon as he discovers the approach of his enemies, lies perfectly close to the branch, or places himself snugly in the angle where two limbs separate from each other. The dogs, however, soon announce the fact of his presence by their baying and the hunter ascending the tree discovers the branch upon which the animal is seated and begins to shake it with great violence to alarm and cause him to relax his hold. This is soon effected, and the Opossum, attempting to escape to another limb is pursued immediately, and the shaking is renewed with greater violence, until at length the terrified quadruped allows himself to drop to the ground, where the hunters or dogs are prepared to dispatch him." The article goes on to tell that after the opossum drops to the ground, he will roll up and play dead. He then waits until he thinks his "persecutor" is gone, but if he discovers he is still there, he will again appear to be dead and thus the saying "He is playing possum." After reading about the process for preparing a possum to eat, I decided that what Elder Murphy shared was probably enough and I would leave the rest up to your imagination. What is your favorite meal to serve company? Sitting on the banks the beautiful Euharlee Creek is Hightower's Mill. 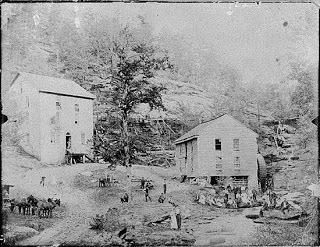 Located at the base of the Appalachian Mountains and a short distance from Cedartown, Georgia, the mill was built about 1843 by Elias Dorsey Hightower and was largely a grist and woolen mill. 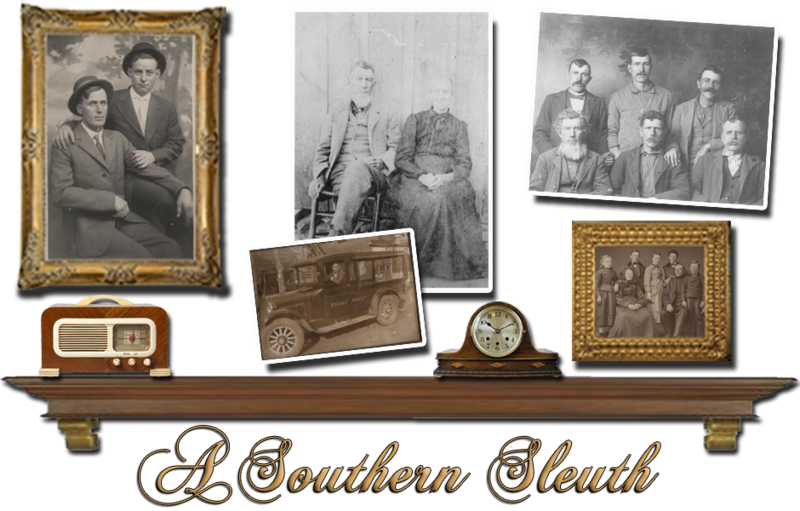 Apparently, John Monroe Ganus and his sons spent some time there because Elder Murphy and John M. Ganus visited John's oldest son and my great grandfather, William Franklin Ganus, there early in the fall of 1886. Sept. Friday 10, 1886……..about noon Bro. 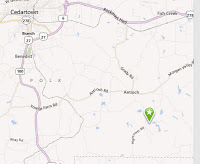 [John] Ganus and the boys come from the mill. They laughed at me about not stoping at the mill all knight. I told them that I had got tired of living or lying on the soft side of a board during the war. Stayed all knight at Bro. Ganus." An additional entry in the Murphy journal indicates that Frank had some interest in working in a mill as the Ganus family prepared to leave and that Utah was initially a possibility for these Georgians' relocation. "Sept. Sunday 11, 1886 Saturday I spent the day at Ganuses wrote a letter to Bro. D.H. Peery of Ogden concerning W.F. Ganus getting a job with him in the mill." In reading about D.H. Peery of Ogden, I learned that he owned the Weber Grist Mill in Ogden, Utah, which leads me to believe that Frank likely was familiar with Grist mill work and possibly worked within the grist mill portion of the Hightower Mill. I had hoped to find a clue in census records, but of course, 1890 is non-existent and on the 1880 US Federal Census, Frank (William on that particular census) is listed as a farmer, so the census does not provide any additional clues to what Frank may have done within the mill. In addition, the above journal entry creates a new question. Why were John and his boys all coming from the mill on Friday? Did they all work there? All census records seem to indicate that John and his boys farmed. Today the ruins of the mill still stand. The present day owners purchased the property back in 1996 and, realizing the importance of the historical site, they made the property available for special activities such as weddings and family reunions. Standing on 100 acres, there are 12 camping cabins, pavilions and picnic areas and facilities. 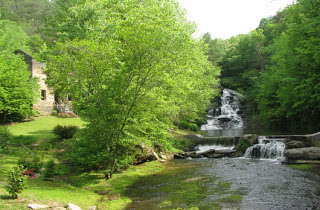 To see more pictures of the present day site and read about the history of the area, visit Hightower Falls. The area has been beautifully preserved and although the purpose of the site has changed over the years, the ruins stand as a reminder of an earlier day when it was a bustling mill and served the surrounding communities. As I look at the pictures of the mill above, I can almost imagine John and his boys leaving through the arched stone door, laughing and talking to each other, but tired and eager to get home at the end of a long day.